Base and subbase layers form the structural platform of flexible and rigid pavements. Both layers are commonly made of selected granular material and properly compacted to provide an adequate bearing ability. Improper drainage of these two layers creates various structural defects that ultimately caused failure. Thus, it is of prime importance to evaluate the hydraulic conductivity of these two layers to avoid any structural damage of the pavements. The current paper is an attempt to evaluate the hydraulic conductivity of several gradation of granular materials in sequences layers usually selected and commonly used as base and subbase course material in pavement construction. 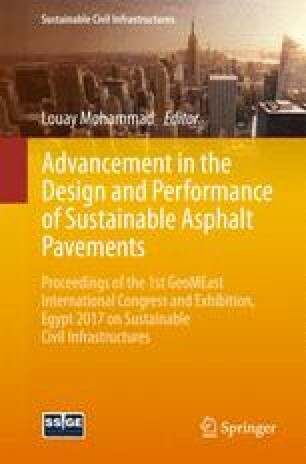 The selected materials confirm with SORB specifications (State Commission of Roads and Bridges) issued in Iraq in 2003 for granular base and subbase layers. The tests were performed under constant head condition within the range of validity of Darcy’s Law and laminar flow conditions in double layers sequence. Regression analysis of the test results revealed that the hydraulic conductivity is a function of the in place void ratio, mean particle diameter and degree of packing of the granular material. These parameters are presented in the form of equations and can provide approximately quick estimate of hydraulic conductivity of each granular layer.